Pedro Manuel Álvarez Jr. (born February 6, 1987) is a Dominican-American professional baseball first baseman with the Pittsburgh Pirates of Major League Baseball. Álvarez has been nicknamed El Toro, Spanish for "the bull", because of his strength and muscular physique. He stands 6'3" and weighs 250 lbs. He has one younger brother, Luis Fernandez. A third baseman until late 2014, Alvarez has since transitioned to first base for the Pirates. Álvarez was born in the Dominican Republic to Pedro and Luz Alvarez. Alvarez also has a sister. Father of Wilfredo Alvarez. As a young boy, he grew up in the Washington Heights neighborhood in the New York City borough of Manhattan. Álvarez first attended the Mott Hall School for gifted and talented students in Harlem, where he was an A student. He then attended Horace Mann School in the Bronx, where he holds numerous baseball records, most notably home runs, batting average, on-base percentage, slugging percentage, and RBIs. Álvarez was named Athlete of the Year his senior season. Though he attended a private school, Álvarez's abilities attracted the attention of scouts throughout the New York City area, especially after he led his club team, the Bayside Yankees, to a national title in 2005. In recognition of his success, Louisville Slugger crowned him the Player of the Year in New York and also named him to its All-America team. After graduating from high school, Álvarez was drafted in the 14th round of the 2005 major league draft by the Boston Red Sox. Though offered a substantial signing bonus, Álvarez instead chose to play college baseball for the Vanderbilt Commodores of the Southeastern Conference. Álvarez started slowly and had some trouble adjusting to the college game. However, after growing comfortable, he became an integral member of the Commodore lineup. Álvarez put up some of the best offensive numbers in the history of Vanderbilt, setting single-season school records in home runs (22) and second in RBIs to Warner Jones. These stats earned Álvarez National Freshman of the Year honors from several publications, including Baseball America. Álvarez was then selected to the USA National team, leading the team in batting average. Baseball America ranked him as the 2nd best pro prospect on the squad. In addition, Sports Illustrated ranked him as the best pro prospect on the team and said that he was the "early favorite to be drafted first in 2008," due to his impressive performance over the summer and as a freshman. Before the 2007 season began Álvarez was named to the watchlist for the SEC and national player of the year awards. He was also chosen as a 1st team pre-season All-American. During the season, Álvarez had great success, hitting .397 with 17 home runs, 65 RBI, 72 runs, an on-base percentage of .467, and a slugging percentage of .706 for the 51-11 Commodores. His strong play was one of the key reasons Vanderbilt captured its first ever SEC regular-season championship. During the SEC Tournament, Álvarez powered Vanderbilt to a come-from-behind championship despite the team dropping the tournament's first game. No other team in SEC history had ever come back to win after losing its first game, and Álvarez was named Tournament MVP. Álvarez was invited back to Team USA after his strong performance in 2006 and would prove to be a leader on the field. He led the team in homers, RBI, batting average, hits, and slugging percentage. Álvarez was drafted by the Pittsburgh Pirates in the first round (second overall) in the 2008 Major League Baseball Draft. He agreed to a $6 million minor league contract with the Pirates on August 15, minutes before the deadline but did not immediately sign it. He was placed on the restricted list after the Major League Baseball Players Association filed a grievance against Major League Baseball over draft picks being signed minutes after the August 15 deadline. On September 22, Álvarez agreed to renegotiated terms on a four-year major league contract at $6.4 million. ^ "Pedro Alvarez Stats, Bio, Photos, Highlights | pirates.com: Team". Pittsburgh.pirates.mlb.com. Retrieved 2010-08-26. ^ a b Nelson, Amy K. "Alvarez following in some famous footsteps". ESPN.com. ^ "Wives, like players, face life on the road". April 6, 2011. ^ "KELI & PEDRO: OUR WEDDING". 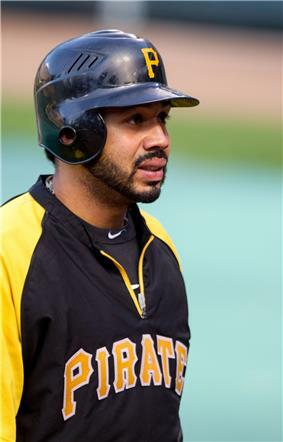 ^ "Pedro Alvarez slugs path from Washington Heights to stardom with Pittsburgh Pirates". ^ "Player Bio: Pedro Alvarez:: Baseball". Vanderbilt University. Retrieved 2008-01-05. ^ "New York Sports". NY Daily News. 2008-02-13. Retrieved 2010-08-26. ^ "SI.com - Team USA players to watch - Aug 4, 2006". CNN. August 4, 2006. Retrieved May 22, 2010. ^ Jenifer Langosch / MLB.com (2008-08-27). "Alvarez holding out, on restricted list | MLB.com: News". Mlb.mlb.com. Retrieved 2010-08-26. ^ "Pedro Alvarez " Statistics " Batting | FanGraphs Baseball". Fangraphs.com. Retrieved 2010-08-26. ^ "Gamelog - Pedro Alvarez". ESPN. ^ "Pirates hold off Brewers after Alvarez's slam leads 9-run first inning". ESPN. 2010-07-20. ^ "Alvarez hits 2 HRs again, Pirates top Brewers 15-3". Associated Press. 2010-07-21. ^ "Pirates pummel Brewers again". Pittsburgh Tribune-Review. 2010-07-21. ^ Matt Fortuna / MLB.com (2010-08-07). "Alvarez sparks Bucs with walk-off homer". Pittsburgh.pirates.mlb.com. Retrieved 2010-08-26. ^ "Pirates Third Baseman Pedro Alvarez named Bank of America Presents the National League Player of the Week". MLB.com. 2010-09-27. ^ "Mike Stanton's big night helps Marlins hold off Pedro Alvarez, Pirates". ^ "Pirates 3B Alvarez named NL Rookie of the Month". The News Tribune. 2010-10-04. ^ "Alvarez HR in 19th inning sends Pirates over Cards". ^ "Pedro Alvarez smacks two long homers as Pirates whip Cardinals, 9-0". ^ Axisa, Mike (3 August 2014). "Pirates considering moving Pedro Alvarez to first due to defensive issues. al". CBS Sports. Retrieved 4 August 2014. ^ Singer, Tom (3 August 2014). "Bucs mulling a move to first base for Alvarez". MLB.com. Retrieved 4 August 2014. ^ Stephen, Eric (10 September 2014). "Pedro Alvarez has stress reaction in left foot, likely out for season". SBNation. Retrieved 27 September 2014. ^ "World Futures 7, U.S. Futures 5 (7)". ^ "College: 2007 College All-America Team Chart". BaseballAmerica.com. 2007-06-15. Retrieved 2010-08-26. ^ "NCBWA > News > 2007 Pro-Line Athletic NCBWA All-America Team". Sportswriters.net. 2007-06-13. Retrieved 2010-08-26. ^ "Price Named ABCA Player of Year:: Junior ace headlines group of five Commodores named to All-American Teams". Vucommodores.cstv.com. 2007-06-18. Retrieved 2010-08-26. ^ Fitt, Aaron (2006-06-30). "College: Alvarez Dominates In His Debut". BaseballAmerica.com. Retrieved 2010-08-26. ^ "College: 2006 College All-America Team". BaseballAmerica.com. 2006-06-13. Retrieved 2010-08-26. Pedro has been married to his wife Keli since 2011. Keli is the daughter of former San Diego Padres manager Pat Murphy. He is also a Christian. 2013 Major League Baseball National League Player of the Week for the period ending June 23. 2010 National League Player of the Week for the week of September 20–26. The 2015 season saw Alvarez become a full time 1st Baseman. As of September 29, Pedro leads the Pirates in home runs with 26. While also leading the team in errors. He currently is batting .244. The Pirates announced on September 10 that Alvarez had been diagnosed with a stress fracture in his left foot stemming from an injury he sustained in-game on August 26. He missed the remainder of the regular season, and was left off of the Wild Card Game roster against the San Francisco Giants. The 2014 season saw Alvarez's defense struggle, with an MLB-leading 24 errors by August 3. As a result, Alvarez was removed from the everyday lineup and utility player Josh Harrison received the starting job at third base for an indefinite time period. This led to the Pirates' considering a move for Alvarez from third base to first base in order to keep his offensive capabilities in the lineup. On August 18, Alvarez made his first Major League appearance at first base against the Atlanta Braves at PNC Park. Alvarez was selected to the National League All-Star team. He also participated in the Home Run Derby, where he hit six home runs. On September 13, he hit an inside-the-park home run. He finished the 2013 season with 36 home runs, which was tied for most in the National League and third-most in the majors, and 100 RBI, which was tied for fifth-most in the NL. On October 9, 2013, he became the first player in baseball history to record an RBI in each of his first 6 postseason games. Álvarez decided not to spend the 2011–2012 offseason playing winter league ball. After the first nine games of the 2012 season, he struck out 13 times in his first 27 at-bats. In an interleague series against the Cleveland Indians, Álvarez hit two home runs in back-to-back games on June 16 and 17, making him only the second Pirates' player with multi-home run games in back-to-back games since 1918, with Ralph Kiner being the other player. Álvarez hit a go-ahead home run in the 19th inning against the St. Louis Cardinals on August 19, the longest game in the majors to that point in the season and tied for the longest in terms of time at 6 hours, 7 minutes. Álvarez hit a 469-ft home run, the longest hit by a Pittsburgh Pirate in the history of PNC Park at the time, in a two home run game against the St. Louis Cardinals on August 28. Álvarez did not immediately continue his late 2010 performance, compiling a .208 batting average and a .587 OPS in 36 games. On May 21, 2011 Álvarez was placed on the 15-day disabled list. After being reinstated from the DL on July 9, 2011 he was optioned to the AAA Indianapolis Indians. Álvarez was named National League Player of the Week for September 20–26 for his performances. He finished the week 10-for-24 (.417) with 2 home runs and 13 RBIs. Álvarez continued his hot streak, going 4-for-5 with 5 RBIs on September 30 against the Florida Marlins while raising his season batting average 8 points from .249 to .257. Álvarez finished the season by winning the NL Rookie of the Month Award for September, hitting .311 and leading all Major League rookies with 26 RBIs in his final 27 games. On August 7, 2010 Pedro hit a walk-off 3 run home run against the Colorado Rockies closer Huston Street. Álvarez recorded his first career multi-homer game on July 20, 2010 against the Milwaukee Brewers. He hit a grand slam in the first inning off Brewers starter Dave Bush and then followed with a solo home run in the following inning. He finished the game 2-for-4 with two runs and five RBIs, helping the Pirates to an 11-9 win. He hit two home runs again the next night against the Brewers, going 3-for-5 with 3 RBIs as part of a 15-3 Pirate victory. The home runs came against Milwaukee starter Randy Wolf and reliever Kameron Loe. After the game, Álvarez had raised his batting average over 60 points, from .197 on July 9 to .259. "Obviously, those first few weeks, it’s a million miles an hour, and as time goes on you get used to it a little bit more and more." said Álvarez of his early struggles. "It's very fun to go out there and play some good baseball and come out winning. It makes it that much better when you have a good day that you can celebrate with your teammates." His first Major League hit came against the Cleveland Indians on June 19, 2010, an RBI double over the left-field wall off Indians starter David Huff. The following several weeks of his career did not go so smoothly, however. He struck out at least once in each of his first 10 games, capped off by a 4-strikeout game in a 14-4 loss to the Oakland Athletics on June 25, 2010. Pirates manager John Russell then gave him a day off. His first Major League home run came against the Philadelphia Phillies on July 3, 2010, a solo shot to left field off of Phillies starter Kyle Kendrick. Following his benching, Álvarez responded with an eight-game hitting streak from June 28-July 6 that included 2 home runs, 3 runs scored and 4 RBI. Álvarez was called up to the MLB on June 16, 2010 and made his Major League debut against John Danks of the Chicago White Sox. He went 0-for-2 with a walk, a strikeout, and a run scored. Álvarez started the 2010 season with the Pirates Triple-A affiliate, the Indianapolis Indians, as the 8th-best prospect in Baseball America's 2010 rankings. In 66 games with the Indians, he hit .277 with 13 home runs, 53 RBI and 4 stolen bases.